Delia is credited with music for I Think In Shapes in the series Henry Moore at the Tate produced by John Gibson, first broadcast on 27th August 1968. "The retrospective exhibition of Henry Moore's life's work, arranged by the Tate Gallery in 1968 to celebrate the artist's seventieth birthday. 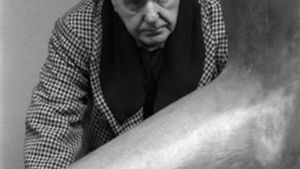 Henry Moore walks among, touches, and speaks about his creations." Henry Moore walks among the pieces in the open air exhibition of his works in the grounds of the Tate gallery. Broadcast on 27th August 1968 at 8.00pm on BBC2. In the BBC Sound Archive on tape TRW 6909. ↑ 3.0 3.1 3.2 The Tape Library List's entry for TRW 6909. This page was last modified on 14 June 2017, at 14:53.